1 1/4x 3x 3 1/2" very very clear triangular Arkansas quartz cluster with sparkling drusy accentuating its' 'glass bottom'. The erosion of calcite has yielded a fertile ground: crystal clear crystals, several with 7h faces, one with 8...one missing a face but having a rare doubled face of a diamond window AND a 7h face to it as well as extra prism faces. 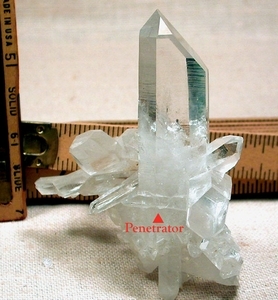 Extremely attenuated [and obvious] penetrators. Needle crystals. Tabular crystals. Twins - one set with contact faces. Rainbows. Made even more memorable in our book, The Buyer's Guide - did you order your copy yet? Self displays in a number of brilliant ways. Yes, please email us for additional photos.